CAPE ELIZABETH—Lake Region surged ahead of the Capers – Julia Murch, Jordan Weese and Savannah Silke all scored – in the top of the seventh on Friday afternoon, April 12. The Lakers, though, couldn’t hold onto that momentum and stumbled come the bottom of the ninth, when Dana Schwartz crossed the plate for Cape to secure a W for the home team, 7-6. 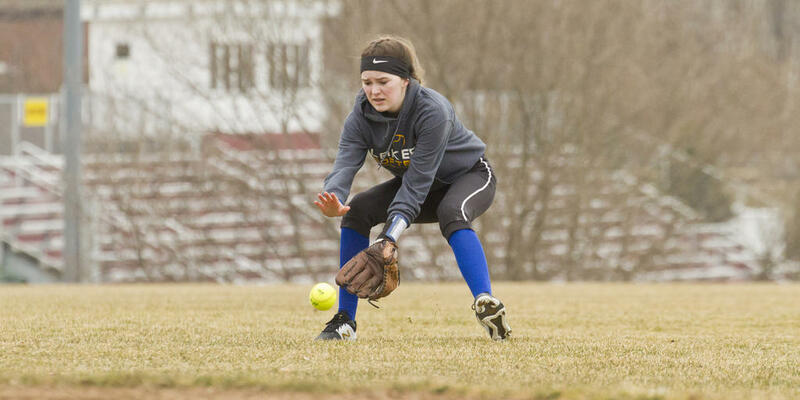 “Being our first time outdoors and against ‘live’ pitching, we struggled offensively putting the ball in play over the first three innings, striking out seven times – six were swinging,” Lake Region head coach Wayne Rivet said. Haley Fernald started on the mound for Lake Region – and started hot, striking out the first three batters she faced, all of them swinging. Cape tallied two runs off Fernald in the second, however, and another in the third. Murch got one back for the Lakers in the top of the fourth. Murch reached base on a successful bunt, then advanced to second on a passed ball during Weese’s at-bat. Weese’s own bunt proved successful as well – she barely beat the throw to first, but she beat it – and ushered Murch over to third. Murch raced home on another passed ball, this one during Delaney Meserve’s turn at the plate. Abigail Scifres scored the Capers’ fourth in their next ups, regaining them a three-run advantage; Cape then held their guests silent in the top of the fifth before adding yet another, and thus expanding their lead, in the bottom of the same inning. Lake Region chipped away at the Capers’ upper-hand in the sixth, hashing two: Maddie Rock and Brooke Harriman both scored for the Lakers. Rock, Harriman and Fernald captain the team this spring; all three are seniors, and all three hit over .300 last year. The Lakers did dig deep in the top of the seventh, when they dashed out front 6-5. Silke scored the first of the team’s trio of tallies in the stretch, with Murch and Weese following her up. Delaney Meserve laid down a bunt with two strikes – a moment Rivet called “a big play” – to allow Lake Region to seize control. But the comeback wouldn’t grow into a victory: Cape rebounded in the bottom of the seventh, with Cornell tying things up 6-6. Then, two full innings later, the Capers earned a walk-off win, Schwartz coming home on a Scfires single. So Lake Region opens on a loss – but not one to hang their heads over. Savannah Silke reels in a grounder for the Lakers. Senior Captain Haley Fernald hurls a ball toward home from the circle. LRHS pitcher Haley Fernald fires a shallow trickler over to first. Hailey Gove unwinds through a swing. Delaney Meserve tracks the action from her position playing second base. Julia Murch held down first for the Lakers. Jordan Weese mans third base for the Lady Lakers. Sadie Tirrell takes a cut at the plate. Julia Murch leads off third late in the game for LRHS.